Super Hero Boy: A toddler friendly MP3 player!! A toddler friendly MP3 player!! Connor loves my mp3 player, but sadly its tiny and fragile, and kind of a cheap one but it does have a built in speaker and he steals it any chance he gets. The only problem with that is it doesnt work so great anymore as he has dropped it a zillion times and I am constantly looking for it as he has a tendency to hide things, and has recently just started this habit of putting things in the trash for me. Its really quite adorable and he is only trying to help mommie clean up but sometimes he puts things in the trash that shouldn't be in there.. like my cell phone. Needless to say at the moment I have NO clue where my mp3 player is and I fear that it might have ended up in the trash or worst.. the toilet.. so with that said I have been looking for him a mp3 player of his own that was durable enough to stand up to his abuse and simple enough that he could work it himself. When I came across the SweetPea Mp3 player, at first I was a bit thrown off.. its much bigger than an adult mp3 player with this big ring at the top for a handle. Though the first time I handed it to Connor I realized just how wonderful it really was. The SweetPea Mp3 player is really easy to operate, there are three buttons two directional buttons and a stop button which also serves as the play button. Connor is just 14 months old and he has already figured out how to turn it on and off and even flip between songs. That big handle on the top is brilliant as not only is it easy to carry for a little one but its also easy to spot when Connor crams it into the bottom of his toy box or tries to wedge it between books on our book shelf. Its also really sturdy.. and yes sadly Connor has already dropped it several times and we have yet to have any issues with the player nor does it even skip when dropped thus far. Mind you I would not suggest you throw it across the room but does seem to hold up fabulously to toddler mishaps. Though it runs on batteries we have been using it daily for almost two weeks now several times a day and I've yet to have to change the batteries. Though the SweetPea Mp3 Player does come with a wall adapter which is great for using it at nap time or bedtime. One of the best features though is the fact that the control menu is hidden from kids. You have to hold two of the buttons down at the same time to access the menu which controls the volume, allows you to choose between diffrent play lists, and you can even set an auto off feature on how long you want the player to play before automatically turning itself off. This is brilliant at nap time and even better if you have a little one like Connor who LOVES volume settings. Connor can listen to his music and I can decide how loud it is depending on where we are at and whats going on. Really my only complaint is there is no expansion slot for a memory card. I would love to load in all of Connor's music and sort them between the play lists but the player holds about 256mb of files which is approx two to three of Connor's cds depending on which ones we load in. Thats not bad but I would love it it would hold about three times as much. I actually have all of Connor's cds loaded onto a SD card for my other mp3 player and it would have been fabulous to be able to just move that SD card over. Either way its a much better alternative to letting Connor beat the crap out of my mp3 player (if I ever find it again) and really thus far the best mp3 player we have seen for the toddler and preschool set. 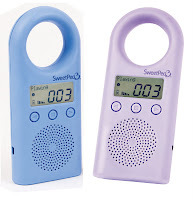 The SweetPea Mp3 is available direction from their Sweet Pea Toys website! I actually just bought one and am uploading mp3s now for my kid... it now has 1G of memory, they say about 16 hours, which is wayyy more than enough. But I would really like to be able to switch out the music and have more than 3 playlists. At just 3 playlists, that would make over 5 hours of 2 min songs per list... that is a LOT to scroll through to find a song!